Last year I set myself the challenge of not buying any new clothes from high street stores, but to re-discover some of the forgotten contents of my wardrobe and only buy vintage and second hand clothes, and to make the rest. I blogged about a wonderful red wool jacket I bought from the Air Ambulance shop, A cardigan knitted in record time for a wedding and in Wovember showed a sample of a wonderful Liberty dress bought from Oxfam. I picked up other odds and ends from assorted charity shops and the Women’s Centre jumble sale and met my challenge. Despite having been concerned that my underwear may not see me through, I actually emerged from the challenge quite adequately provisioned in that department, but with a rather sad looking sock drawer. So this year’s challenge is to knit myself socks – 1 pair a month. I’ve never been the most enthusiastic sock knitter. I’ve made a few pairs and been given a pair and to be honest they are wonderful. Warm and so much better wearing than my bought socks. 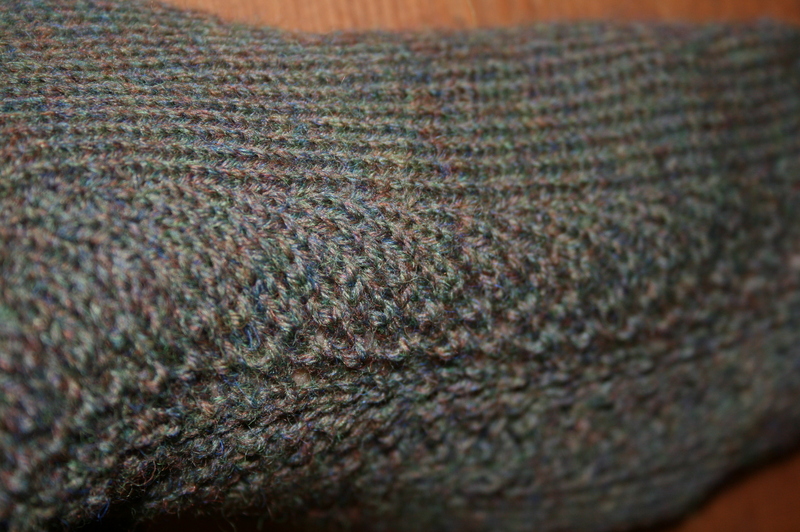 However, I had developed a few prejudices about socks, for example, I don’t like cuff down, only toe up, and I’m terrible at getting the second sock finished. So it was with a little trepidation that I embarked on this challenge. I prepared myself. I took sock yarn; some wonderfully heathery vintage King Cole Little Dorrit, needles and pattern away with me on holiday. 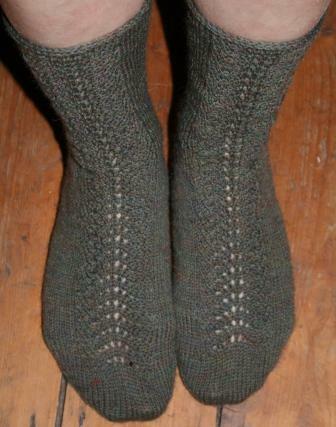 My chosen pattern was to be Ann Kingstone’s Fountains Socks that appeared in The Knitter, Issue 34 (July 2011). A toe up, with a little bit of pattern and an interesting construction making the increases in the arch of the foot. Nothing much happened for much of the break, I was busy on other projects, including emergency pot grabbers for my mother in law after my sister in law commented that there were no pot grabbers in the house as she tried to manage a heavy pan of pasta with a tea towel. You see it didn’t take much to distract me from my task. I also worked on a top down aran design for my nephew, still not done but one I’ll come back to, finished off a jumper for P that I had started in 2009 and got bogged down in the swathes of stocking stitch but now thankfully done, and I started a Gay Bolero from Susan Crawford‘s ‘Stitch in Time Vol.2’ and now almost done. So as you can see I had plenty to distract me from the socks. The day before we left to come back home I thought I’d best get the cast on done as that might be tricky in the car, and the next day as we started our journey I began the socks. All was going well until I flicked my active needle and it fell between the floor of the car and the door. So that stopped me until we had to stop for the toll ticket for the motorway at Florence. P had pulled up close to the ticket machine but I had to open the door let my needle fall and then retrieve it from the ground all in the small amount of space between us and the ticket machine… Luckily it was quite quiet at the toll station. Anyway, I knitted my sock whenever I wasn’t driving throughout the journey described in my last post, and by the time we were in the channel tunnel I was busily casting off. The pattern is fabulous, I loved knitting it. 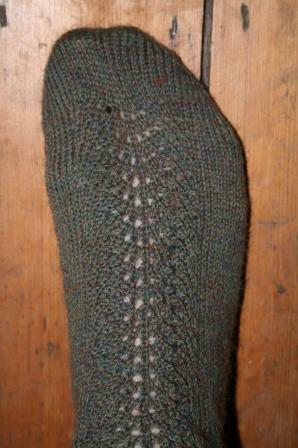 The pattern is almost instantly memorable, the construction wonderful, and I do love the slipped stitch heel. It’s also very clearly written which was just as well when I also had to remember directions and junction numbers rather than stitch counts in my role as navigator. I enjoyed it so much, rather than be reluctant to start the second, I couldn’t wait. Unfortunately once we were through the tunnel it was too dark to be able to do the cast on so I had to wait until we got to my parents in Dorset. But I cast on that same evening and over the weekend and the subsequent drive back to Lancaster had much of the second done, and then as we vegged out on the couch on the Sunday night completed the second sock. So 4 days in total and a new pair of socks. A good start to the challenge I think. 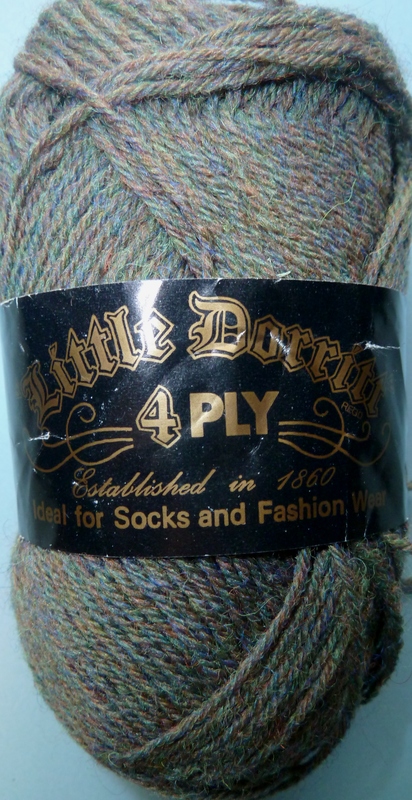 And a note about the yarn: King Cole Little Dorritt 4 ply – 80% wool, 20% nylon. This yarn was ‘Made in Hyde, Gt Britain’ by Sejeant Textiles. I can find no reference to textile manufacture by Sejeant in Hyde but only references to Serjant knitwear up the road in Kendal. Also according to this ball band either King Cole or Little Dorritt were established in 1860, whilst King Cole’s website shows them as established in 1935. So I didn’t get far in trying to track down the provenance of this yarn. style of your last one.